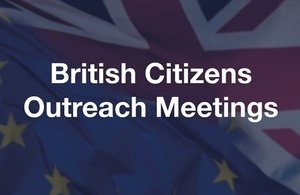 The British Embassy Prague has been holding meetings to inform British citizens working and living in the Czech Republic about their rights as Britain leaves the European Union. We are keen to reach as many British nationals in the Czech Republic as possible. We are therefore announcing further events. This is your opportunity to ask the questions that concern you. The meetings are free and open to all interested British nationals. Please make sure you register if you would like to attend. To receive updates on outreach events in your area, follow us on Facebook (BritsinCR) and keep an eye on this website for more news. 10 April 2019 Added link to the recording of the presentations given at the event in Prague on 9 April 2019. 3 April 2019 Added information about an outreach event in Prague on 9 April 2019. 1 February 2019 Added information on an outreach event in Brno on 19 February.